Once upon a time in my childhood, my year revolved around the “kid holidays;” the beginning of “school’s out” for summer, Halloween, and Christmas. In my candy-addled mind at the time, Halloween loomed pretty large – not quite as big a deal as Christmas, but one in which kids were kind of autonomous. We had to work for the biggest candy haul possible, whether we or our parents made our own costumes or had store bought ones. The year I was old enough to go out trick-or-treating on my own was probably when I was… 7 or 8, although I stuck with the other neighbor kids in an area bounded by about 1 or two blocks on either side of our street, but not across the busy street west of us. A block east of us, there was a gully, so that served as an irregular border on that side. As I got into my 9th, 10th, and 11th years, I had a bigger range: my costumes were never pretty princesses, they were generally tomboyish ones like pirates and gypsies and hobos. Once I think I was some kind of space alien with googly eyes Mom found on a crazy craft-glue yarn base built on a balloon – although that may have originally been my niece Ranny’s costume. Anyway, my costumes had to be practical and allow freedom of movement, because I had a lot of blocks to cover. Toward the end of my career as a trick-or-treater, I went several blocks on either side of our house, almost as far as my school 6 long Salt Lake blocks north, and I went east along all the streets that hung on the edge of the gully until the curve brought me uncomfortably close to the range of a childhood enemy, into whose turf I didn’t care to stray. Mostly, I was out on my own then, until 9 o’clock at night. I’d return with my plastic pumpkin full of goodies – and yes, my last year I took a pillowcase, like the “big mean guys” who still went around in their teens (pathetic, really, but I had to admit the pillowcase got me some negative comments that last year). I had a strategy: any house that was lit was fair game. Any house that was highly decorated or appeared to have an extra fun feature like a “spook alley” out the back or in their garage was a big draw, and sure to have lots of candy. I mostly remember ringing a lot of doorbells and hollering “TRICK OR TREAT!” and glimpsing the inside of a lot of Salt Lake bungalows. I stayed out as late as I dared but when the streets started to feel empty and the only other ones out were the big kids with pillowcases (who were not above taking a smaller, weaker kid’s candy) it was time to head home and survey the haul. Any house with no lights showing or an unlit porchlight was to be avoided, however, because they were OLD MEANIES who DIDN’T HAVE CANDY. I quickly learned which of the elderly and middle-aged people with no kids living on our street were useless for Halloween candy-gathering purposes; they were nice enough the rest of the year, but mean at Halloween. Oh, they might give an actual neighborhood kid something home-made, but there was a protocol. Home-made stuff was okay only if we knew them and greeted them by name. Strangers, not so much. Even then I remember the warnings about needles and razors in apples and popcorn balls, and so reluctantly I threw those out (the popcorn balls, anyway). People living on other streets with their lights off and not showing any decorations were just mean and not to be bothered with. Well, last night I officially became the mean lady that doesn’t give out candy at Halloween. I have become the kind of adult I loathed as a trick-or-treater. Yes, I barricaded the front walk to prevent kids from getting to the front door. And then I blocked the front door with a lawn chair, and placed a large pushbroom over the doorbell so the li’l dollinks couldn’t ring the damn thing. In this woefully fallen modern era, kids no longer go around in full darkness; most of the activity ends after the light fades. The littlest kids, toddlers really, are still taken around by their parents, but now they’re loaded into the family car and driven to the neighborhoods of friends and family (or simply driven to richer candy hunting grounds, sadly). The evening hour sees a few older kids going around, and then it’s over. But there’s no way for the early ones to see if the porch light is on; they come to the door in packs and ring and knock. Other years here in the neighborhood, I’ve actually dressed up to give out candy, but always had a lot left over which inevitably got eaten by yours truly (David never was big on chocolate candy, and now he’s eating much too healthily). The last couple of years we haven’t bothered to get candy, and it got to be pretty irritating listening to the doorbell ring during the “early shift” of very young toddlers whose parents couldn’t tell the porch light was off. So we started putting chairs and things on the walkway, but they’d just push them out of the way or come around on the side where there’s a bare spot in the flowerbed. 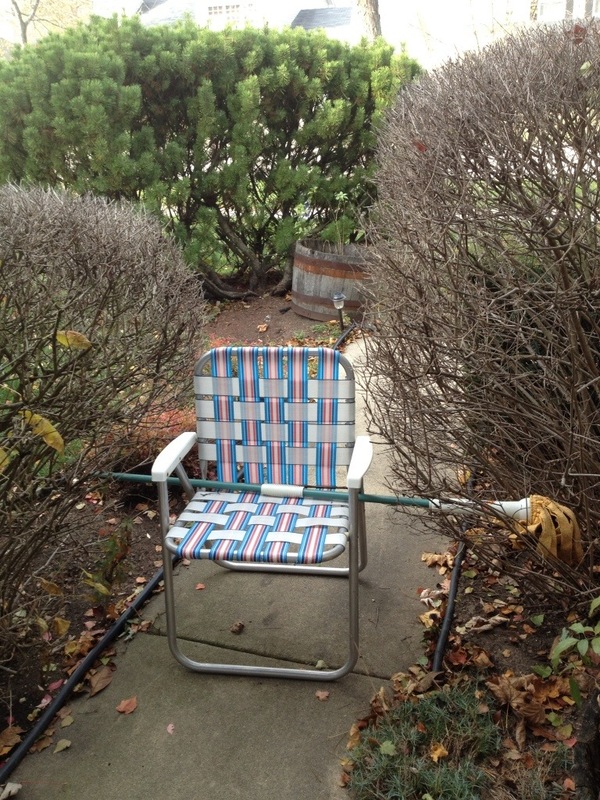 So yesterday, after about the 4th or 5th doorbell rang AFTER placing lawn chairs on the walkway, between two big lilac bushes leading up to the door, I did the Mean Neighbor Lady thing. I sighed and retreated to the hall, and after they left, rebuilt my barricades more thoroughly. That’s when I propped the second chair up against the door (which is not that great an idea if the house burst into flames set by aggravated trick-or-treat toddlers bent on candy-deprived revenge). 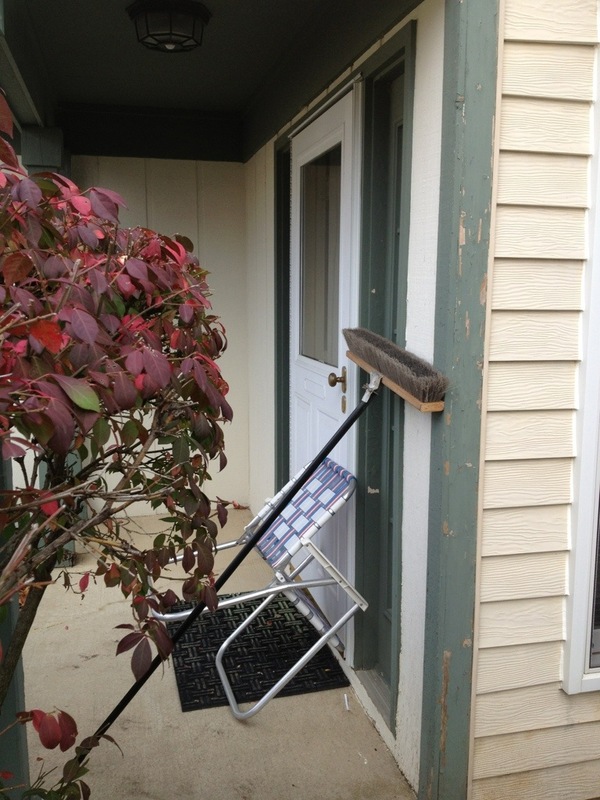 And I also grabbed a big push-broom from the garage and propped it up over the doorbell. A broken mop stuck through the sides of the other chair into the lilac bushes on either side completed my anti-toddler defenses, but of course like the Maginot line there was a big gap on the side where we took out a juniper tree that was too close to the house. Yes, my childhood self hates what I have become. Maybe I’d better buy some candy while it’s still in the stores but on markdown. This entry was posted in Dear Mom, Today and tagged Halloween by ginny. Bookmark the permalink. Hee heee hehehehhheh. It’s so nice to get an actual non-spam COMMENT, Les.